I have been a burger-like mood lately. I mean way more than usual. The delicious burger I shared last week is great – but obviously, like I said, more of a “cheat day” type meal. Lucky for you, this week’s post is still a between-the-buns offering, but is more on the healthy side. Best news? Perfect for a game day gathering – which is majorly important now that football is upon us (Woo hoo!). These savory sliders are easy to prep ahead of time, pop in the oven and during a time out, dress them up and plate them! I had some ground chicken to use and I can only imagine your surprise that it didn’t go towards buffalo something or other. Instead, I added some sautéed onions and marinara sauce that keep the patties from drying out while cooking. I’ve done this as a dinner for two with some crispy zucchini chips as a side, and have also done a big batch for a larger gathering – easy to customize for any size group! 3/4 cup yellow onion, chopped. Heat olive oil in a small skillet over medium heat. 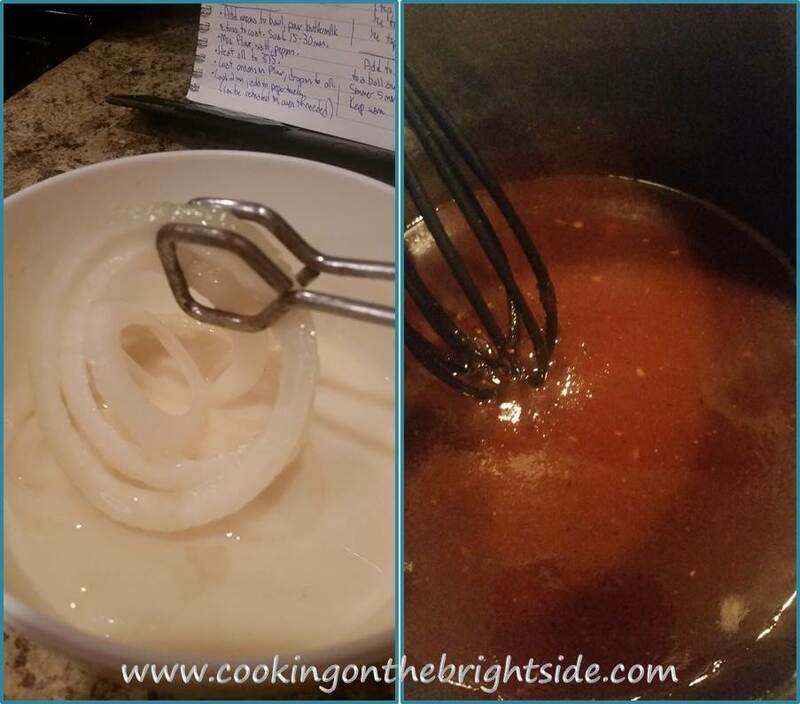 Add garlic, onions and Italian seasoning and saute for 3-5 minutes until onions are softened. In a medium bowl, add ground chicken, half of the Prego sauce, grated parmesan, sautéed onions, bread crumbs, salt and peppers. Mix together by hand until ingredients are dispersed evenly. Form into 8 small patties. Line a plate with wax paper and add patties. Cover and chill at least 20 minutes to ensure binding. When you’re ready to cook, remove patties. Line a baking sheet with parchment paper and cook at 375 for 15 minutes. Flip and cook another 10-15 minutes until cooked through. Remove patties from the oven. Add a cooked patty to the bottom half of each slider bun. (I also spray the top halves and put them in next to the patties to let them toast a little. )Top with about 1 Tbsp. of shredded mozzarella. Add 1 Tbsp. Prego sauce from the remaining 1/2 cup. Return to oven for 5 minutes or until the cheese has melted slightly. 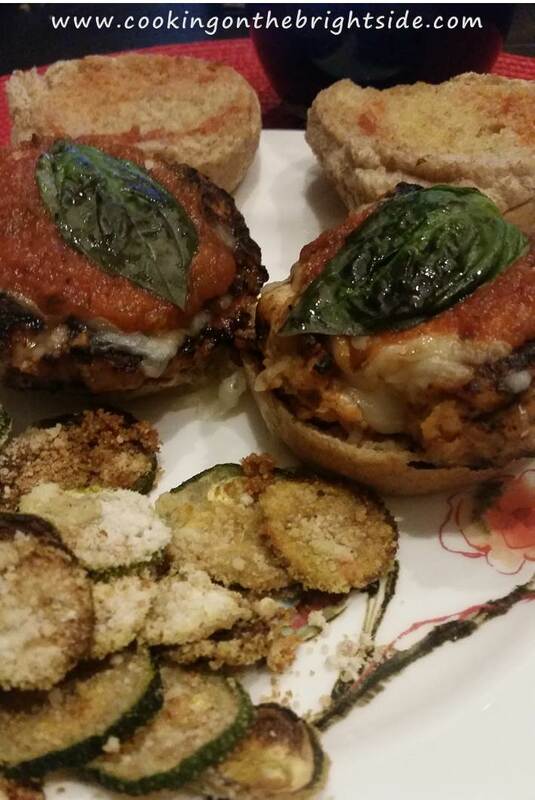 Top with a basil leaf and bun. Right now Annie is stuck in my head. You know, how she’s always excited about tomorrow? Well friends, I am BEYOND excited for tomorrow. Because tomorrow is my Christmas. That’s right – IT’S COLLEGE GAME DAY! 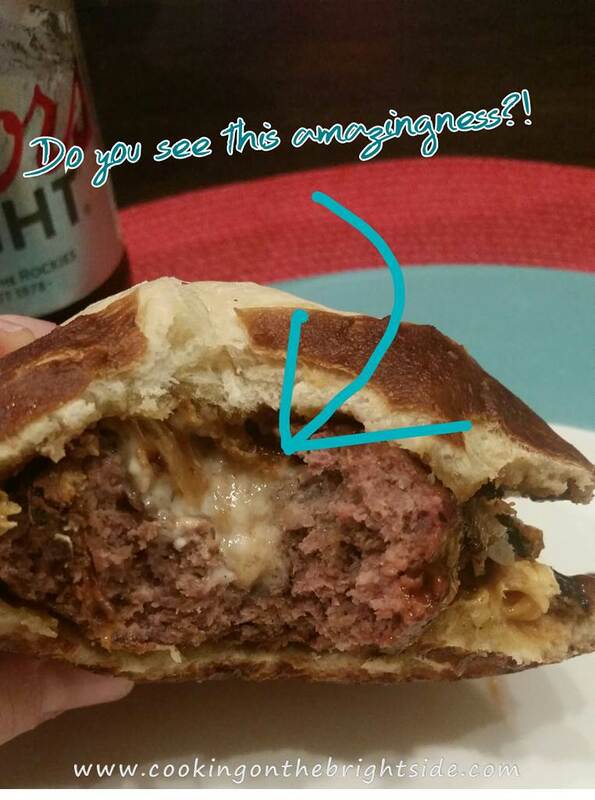 The burger itself is stuffed with blue cheese. I’ve thrown crumbles in the meat before, but this way there’s just a yummy, salty, cheesy center. Delicious by itself. But then we add the whiskey glaze. I am not even a huge fan of whiskey, but it adds a ton of flavor – like a boozy, smoky barbecue sauce. Then, you add the cheese. I just threw a slice on there because it just made life simpler and this burger was already rather ambitious for me. Because then you add the crispy onions. Yeah, I went there. Inspired by and adapted from HalfBakedHarvest – original recipe here. Mix together beef with Worcestershire sauce, salt and pepper. Divide into 4 equal portions and make a well in the center of each. Add 1 Tbsp. 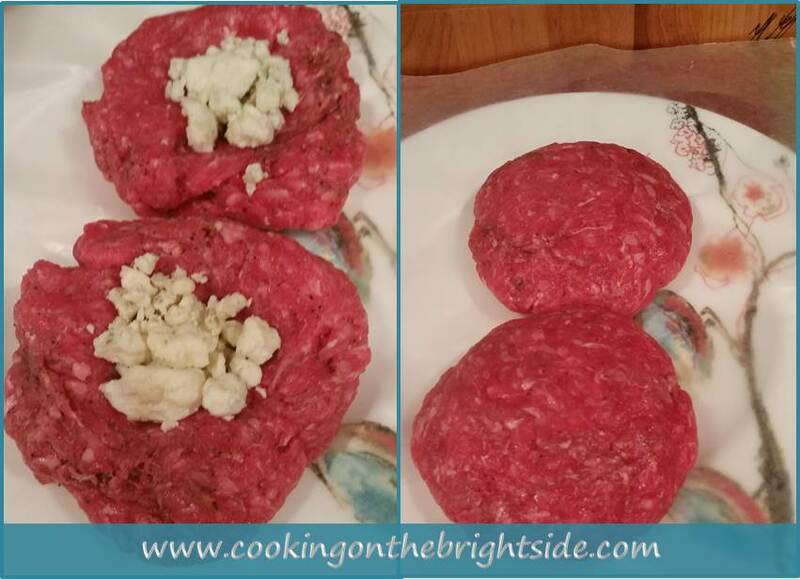 of blue cheese in the well and form the burger around it, enclosing the cheese in the center of the burger. When you’re ready to cook – fire up the grill to medium-high and cook 7-10 minutes on each side until cooked through. Pinch cayenne pepper, garlic salt and black pepper. Add onion slices to milk and soak 10-20 minutes. Add flour and seasonings to large ziploc bag. Remove onion slices, let excess milk drip off, and add to ziploc bag. Toss to coat onions. Heat oil in a medium skillet. Add onions and saute 3-4 minutes, flip and cook another 3 minutes until both sides are crispy. Keep warm in oven if needed. Whisk ingredients together in a small saucepan, bring to a boil. Reduce and let simmer 5-7 minutes until thickened. Keep warm. 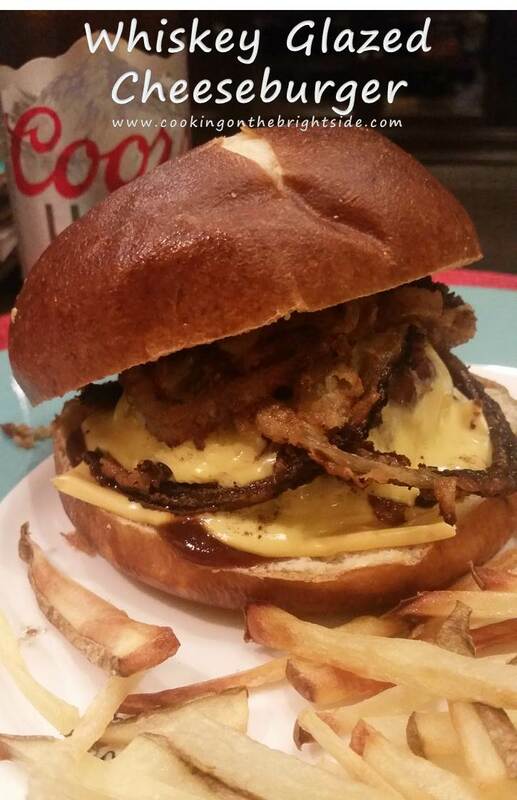 Get your burger bun – I found pretzel buns at our local grocery store and deem them winners! 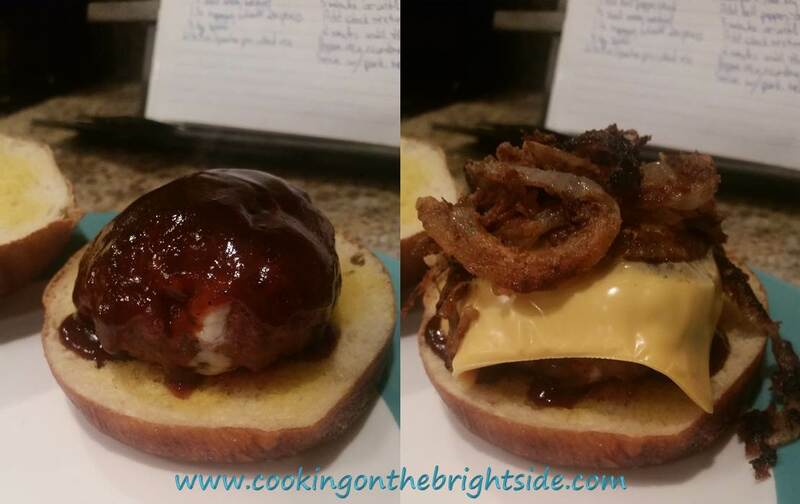 Add your burgers to the center of the bun – which may be slightly larger than the burger (no complaints here!). Spoon glaze evenly over the top of each burger. It’s okay if it seems like there’s a lot – it will run down and start soaking into the bread. Then add your cheese slices. Then top with the crispy onions. Add the top half of your bun and prepare to say “Mmmmm” a lot. The first 2 bites had me amazed that this creation just came from my kitchen. And then I got to the center. Goodness. I may be making this again this weekend to celebrate a hopeful victory for my team(s). If you give this a try – let me know what you think and if you modified it all, I love hearing how people make recipes their own! Happy Labor Day weekend y’all – and happy beginning of COLLEGE FOOTBALL SEASON! I’m going to be honest – I have not been feeling it lately. Y’all know how I love to get in the kitchen and try out new things. But lately, it’s been whatever I can just throw together as quickly as possible. I have been in a cooking funk! Now that we are coming up on the best time of year (football season people!) I am hoping to get my groove back! I have been whipping up some new things on occasion – don’t you worry. And one of them just happens to be a great go-to easy recipe. So it allows me to cook without having to spend an hour in the kitchen prepping things when I just need to decompress after a long day. That’s what I call a win-win! I find my relationship with salmon a little odd. Love it smoked. But sometimes the, well, salmon-ness of it just doesn’t seem appealing. It just always overpowers whatever sauce or breading I try to pair with it and in my opinion, it’s just not great plain. This recipe I found in a recent CookingLight magazine – and it seemed to fit the bill. A little sweet. A little spice. And a little citrus. 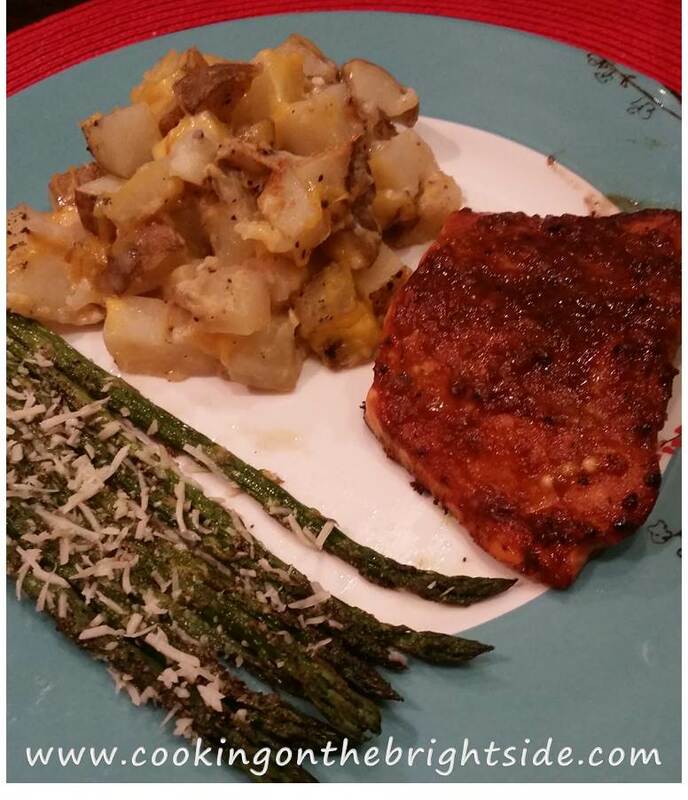 Really complements the salmon flavor without playing complete second fiddle. Give it a try and let me know what you think! In a small bowl, whisk together molasses (original recipe called for maple syrup – I tried with both and found the molasses had a better flavor and look!) zest, juice, mustard, garlic and pepper. 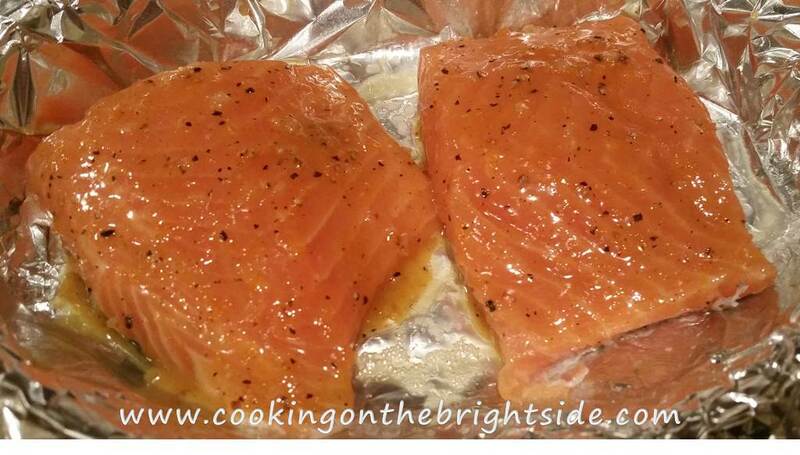 Place salmon skin side down (if applicable) in a lightly greased baking dish. I line mine with foil for this one since we crank up the broiler! Brush the salmon with the orange mixture, covering the top of the salmon. 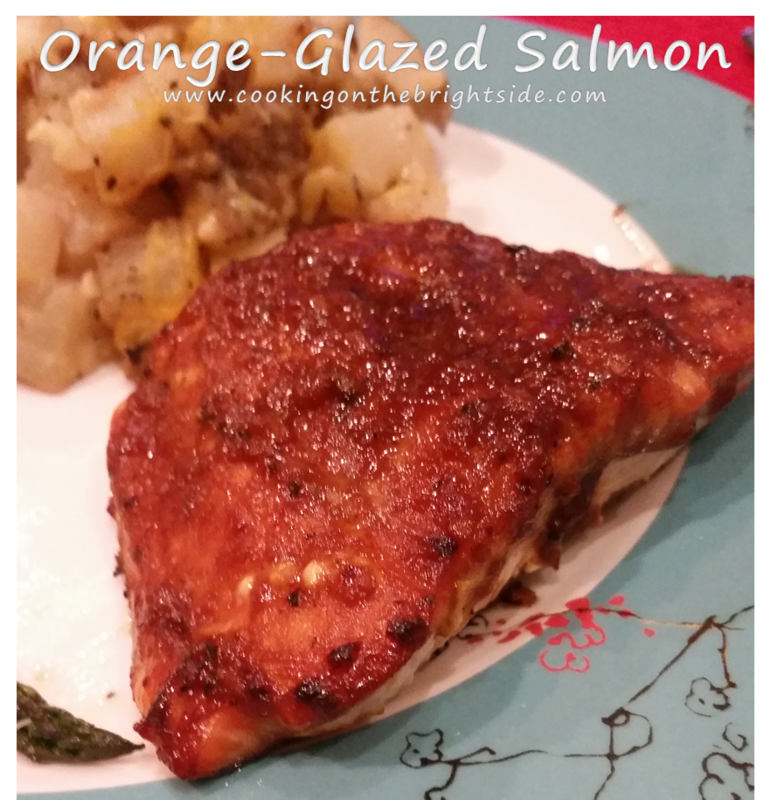 Bake at 400 for 5-7 minutes, then turn on the broiler and broil for 2-3 minutes until the glaze caramelizes. This gives it a delicious, light crust packed with flavor. 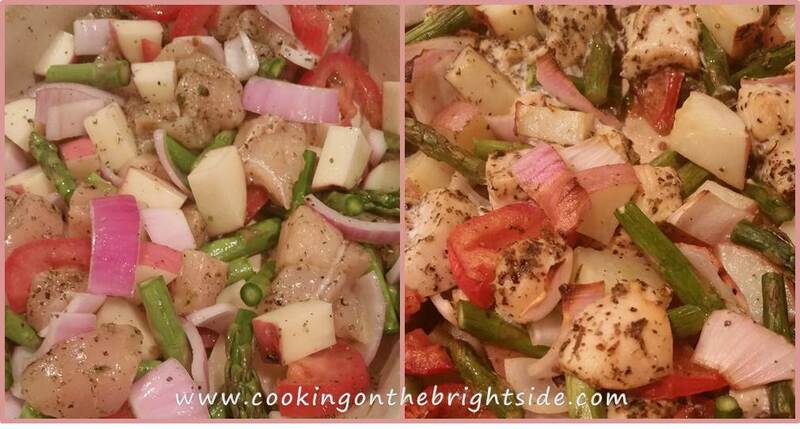 Remove from oven and add to your plate! 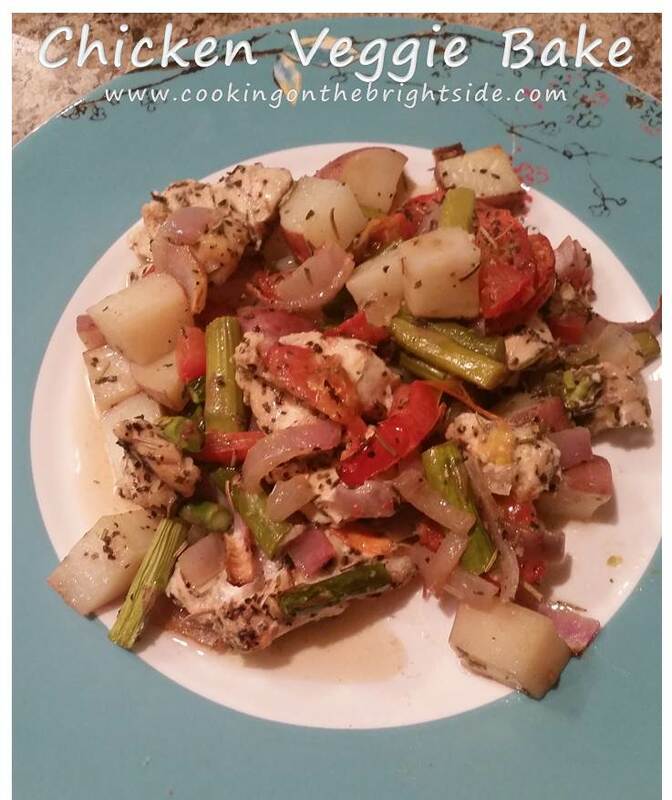 This is such a versatile dish – it goes great with sauteed veggies if you’re a little pressed for time. I also paired it with some of my Skinny Au Gratin Potatoes and roasted asparagus for a fancier meal and it was fantastic. I’m a little embarrassed. It’s been a while FOREVER since I’ve blogged and I’m really hoping I haven’t completely run off any followers with my slacking. It has been a whirlwind – no good excuses, just needed to catch my breath! I figure I’ll try to redeem myself with a few new recipes. That sound okay? Okay – let’s do this! One of the things I rarely post is breakfast. I’ll be honest – it’s an important meal, but something I usually don’t put a lot of effort into preparing. During the week, I pretty much grab a bagel thin and go. Maybe a granola bar. However, when I’m in the workout zone (a place I have been wading in and out of over the past several months – now I’m back IN) I find that weekends are when I really find myself struggling for energy. Saturday morning workouts are awesome, but a measly little granola bar ain’t gonna cut it if I need to be functioning, you know, past 11 AM. 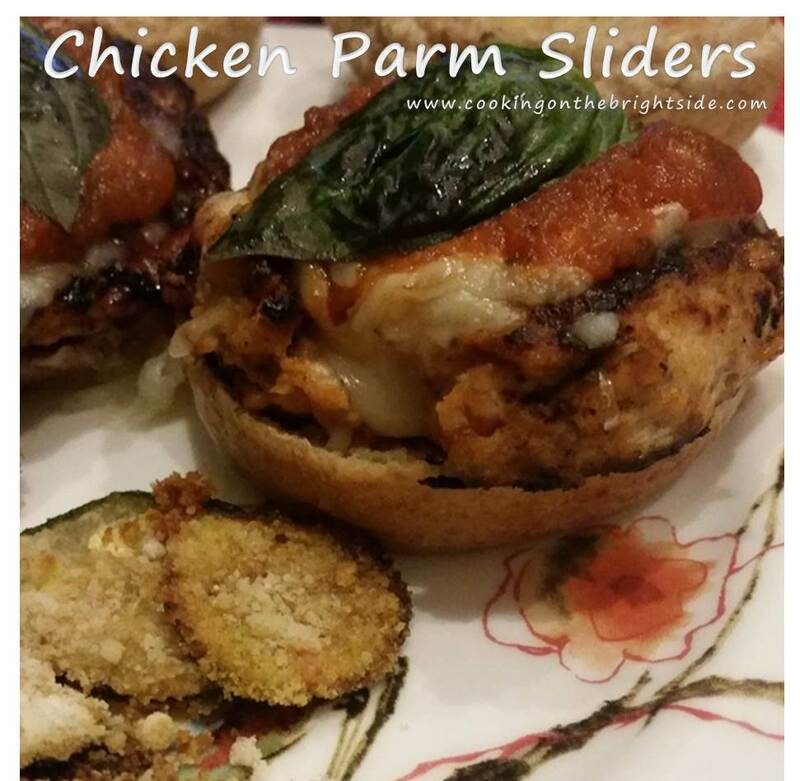 Enter a delicious recipe I found in The Skinnytaste Cookbook that I HAD to make. We know how much I love smoked salmon, but I sometimes struggle with how to use a whole package. So this makes it easy to knock out 2 meals over a weekend, which means fewer trips to the grocery store (hooray!). 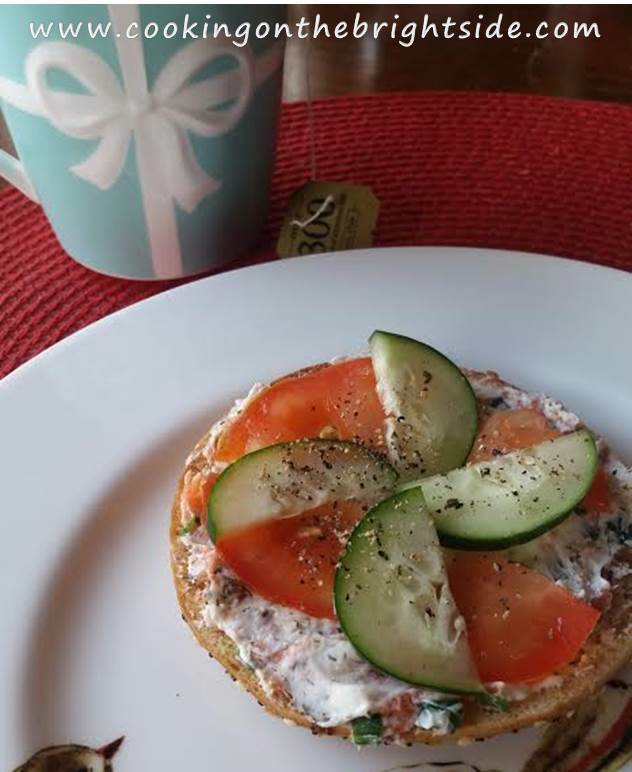 Whether you’re a smoked salmon lover like me or just a casual acquaintance of this fabulous fish, I think you’ll enjoy this as a filling alternative to kick off your morning. 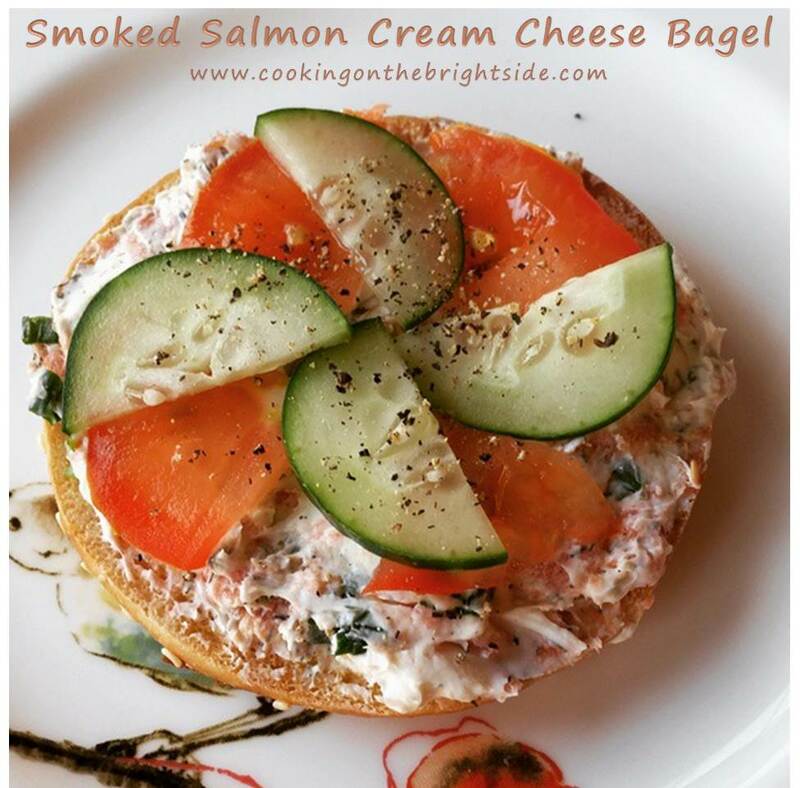 It’s delicious, it’s filling, and come on, that’s a beautiful bagel right there! 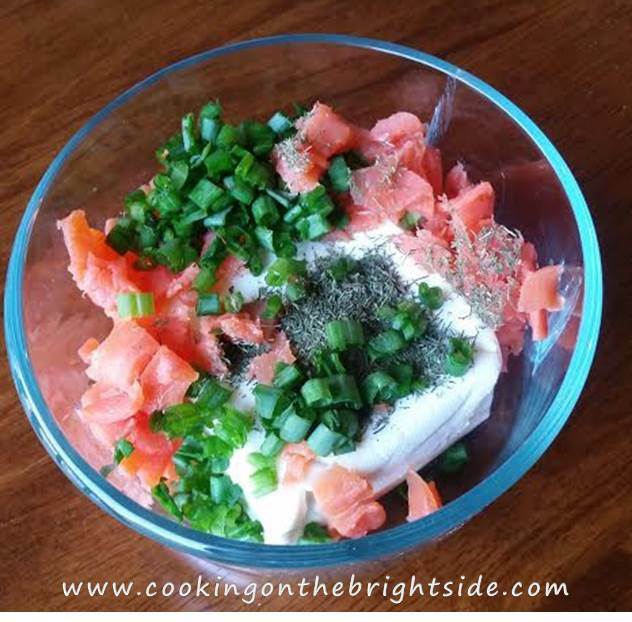 In a small bowl, mix together cream cheese, salmon, scallions, dill, capers and lemon juice. Refrigerate 10-15 minutes to meld flavors. Lightly toast bagel halves. Spread cream cheese mixture evenly across each half, top with sliced cucumbers and tomatoes. Sprinkle each with black pepper and kosher salt. Enjoy and go tackle the rest of your day! When did this happen and why did nobody tell me? Okay, okay. The decorations in my house and the beautiful tree (which IS getting decorated tonight if I can stop procrastinating!) would indicate that I’m well aware that it’s December. But, I’m having a hard time remembering that November happened. Heck, I vaguely remember October! I feel like the days are just flying by right now and this is the time of year when I really want them to last. I absolutely love the Christmas season and it always seems to go by too quickly. Do you ever just want to savor everything? I know I do – I can’t wait for a night when I can go home, hang out by the fireplace with a cup of hot chocolate, listen to Christmas music and stare at our beautiful Christmas tree (again, once it’s decorated!). But right now, I feel like I’m in a race with time. Working long hours to try to get lingering deadlines met before people are out for the holidays. Coming home and trying to put together Christmas lists. Getting Christmas cards ordered. And don’t you know, the parties are coming up. I love me a good party…but when I don’t get to be “at home” for 5 or 6 straight nights, I am just exhausted! It is this time of year when I find it really difficult to eat well. I always feel like I just don’t have the time to cook, so it’s easy to grab something on my way home…because I have too many things to do once I get home. That’s fine every now and then, but when those nights are frequently wedged between dinner parties and cocktail hours, sheesh, no wonder my clothes feel a little snug come Christmas Day! So here’s a little recipe I adapted from Food Network Magazine that is easy, filling and pretty darn low in fat/calories. I also feel like it’s a bit of a comfort food – so perfect for a chilly night. It takes about 30 minutes total – so a simple meal for this busy (but wonderful!) time of the year. I hope you can take the time to sit back and enjoy this beautiful and festive season with some delicious food, quality company, and anything else it takes to get you feeling all holly ‘n jolly. You know, like some peppermint schnapps in that hot chocolate. Adapted from original recipe found here. Heat oven to 350. Brush 1/2 tsp. 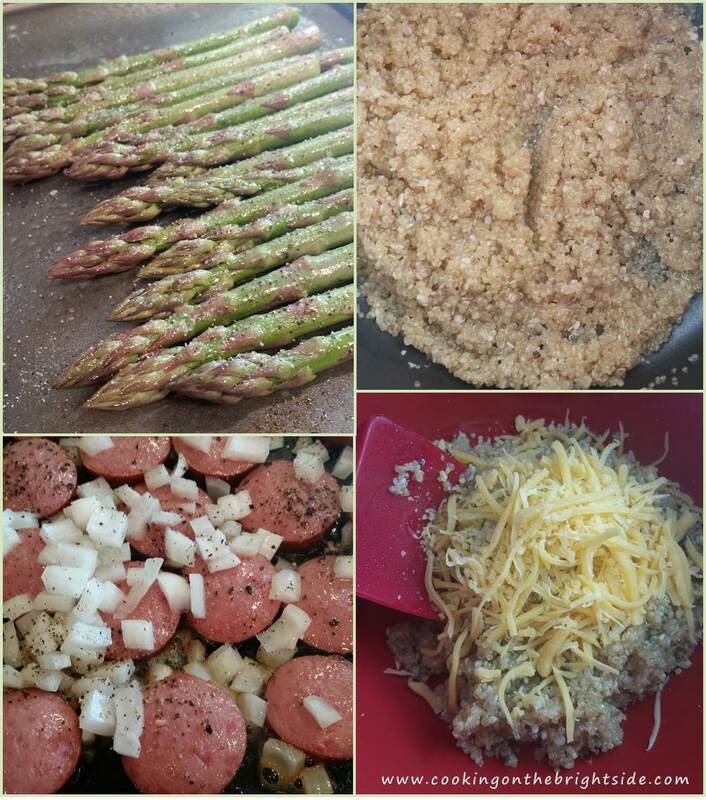 olive oil over asparagus and sprinkle lightly with salt and pepper. Roast 15 minutes. Remove and set aside until cool and then cut into 1-2 inch pieces. In a large saucepan, heat 1 tsp. olive oil. Add garlic and saute 1 minute. Add broth, water and quinoa. Bring to a boil for 3 minutes. Cover, reduce and simmer for 15 minutes until cooked through and liquid is absorbed. 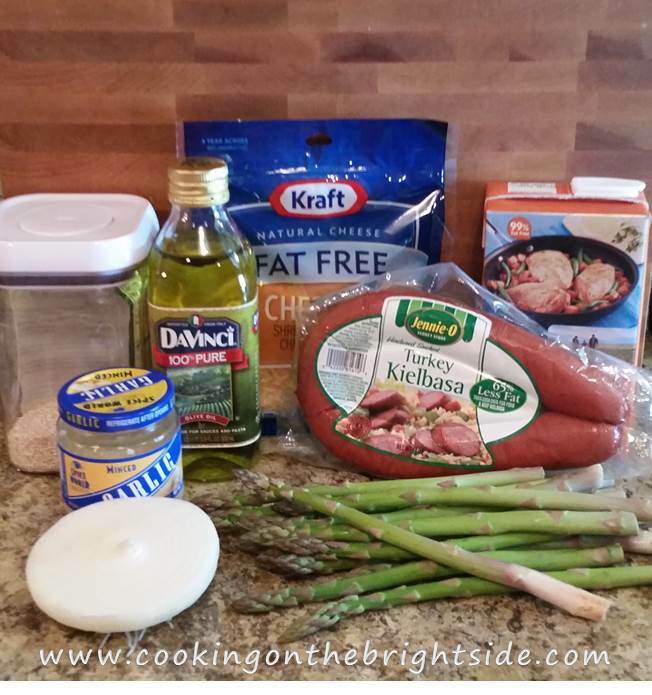 In a small non-stick skillet, add kielbasa slices and saute over medium for 4-5 minutes. Stir in onion, flipping kielbasa slices and cooking another 4-5 minutes. Once the quinoa is cooked, add to a medium bowl and sprinkle with salt and pepper. Stir in 3/4 of the shredded cheese until blended. 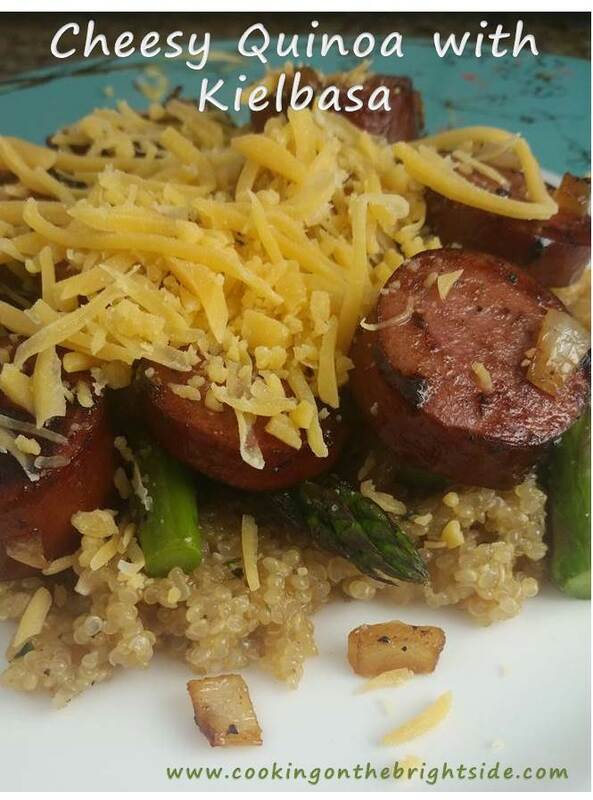 Plate the quinoa and top with chopped asparagus and kielbasa and onions. Sprinkle with remaining cheese. Friends, it’s been way too long…since I shared some buffalo deliciousness with y’all. So obviously, I decided to rectify that. Now, this is a recipe I concocted based on a delicious meal I had with my husband’s family at a little restaurant in Pontotoc, Mississippi. The special was a “black and blue” pasta, so it was blue cheese pasta paired with some yummy charred steak. It was great, but we all know I like some buffalo with my blue cheese. So I have been dreaming up how to pull it off while still keeping it light. I deem this one a success, and it’s perfect to serve with a small group gathered to watch the big game, the perfect balance of fancy and casual. And it can be served with a crisp white wine or an ice cold beer. Everybody wins. To start, bring a medium pot of water to a boil and cook your spaghetti as instructed. 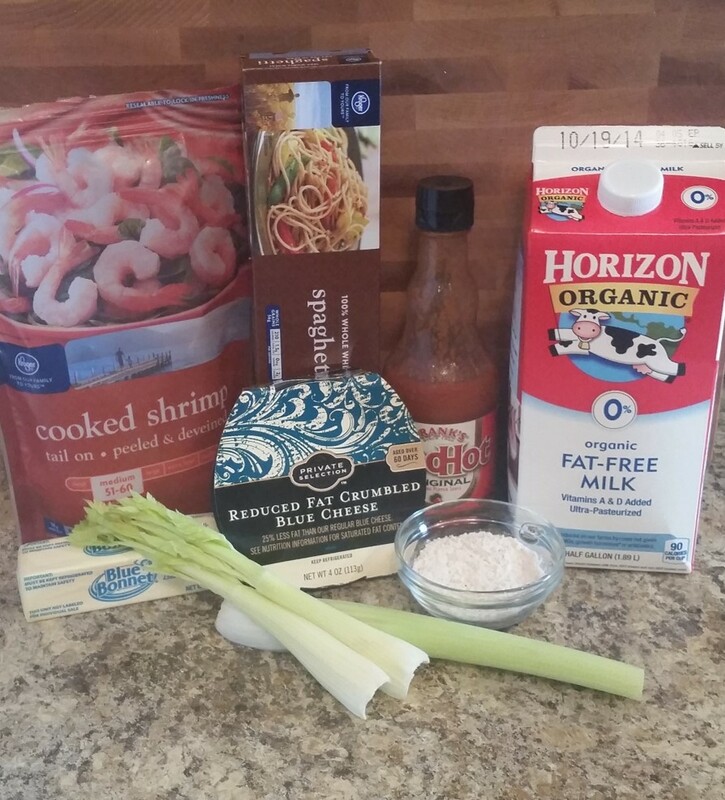 While the water gets going, it’s time to get started on your blue cheese sauce – starting with the roux. If you’ve never worked with a roux, the staple of rich sauces and soups (think creamy mac and cheese or your favorite gumbo) then I’ll give you a brief tutorial. In a small saucepan, melt your butter over medium-low heat. Next, stir in your flour. It will look weird and pasty, but that’s good. Cook for 1-2 minutes to slightly darken (the color of the roux can impact the flavor of your dish or sauce). Now, add a little of your milk (about 1/3 of the full amount), whisking vigorously into the roux. Repeat with the next 1/3, and again until all of the liquid has been added. Once you are happy with the texture, time to stir in the cheese until it has melted. Add a little salt and pepper to taste and adjust accordingly (I probably added another Tbsp. blue cheese crumbles to make sure the kick was there!). Once your pasta has cooked, drain and return to saucepan. Pour blue cheese sauce over the pasta and stir until coated. 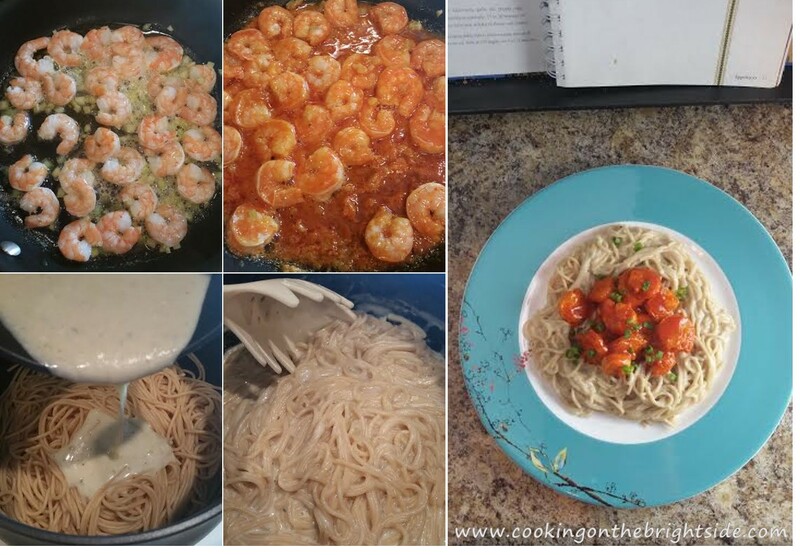 So the pasta is in good shape – time for the shrimp! 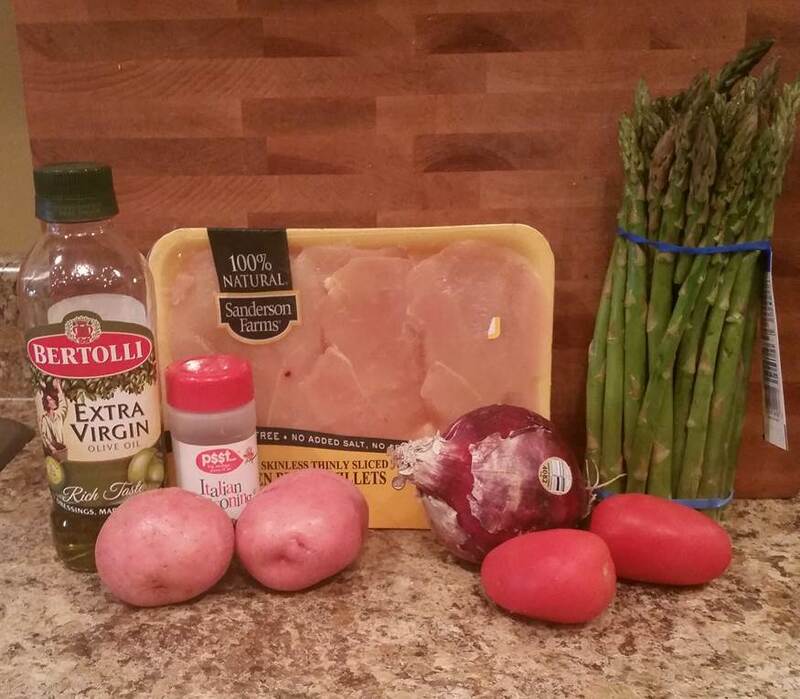 In a medium skillet, add 1 Tbsp. margarine and melt over medium heat. Add chopped celery and shrimp. Saute shrimp for 1-2 minutes, then pour Frank’s Red Hot Sauce over the shrimp. Toss shrimp to coat and cook 4-5 minutes until heated through and hot sauce has reduced slightly. Now it’s time to assemble. 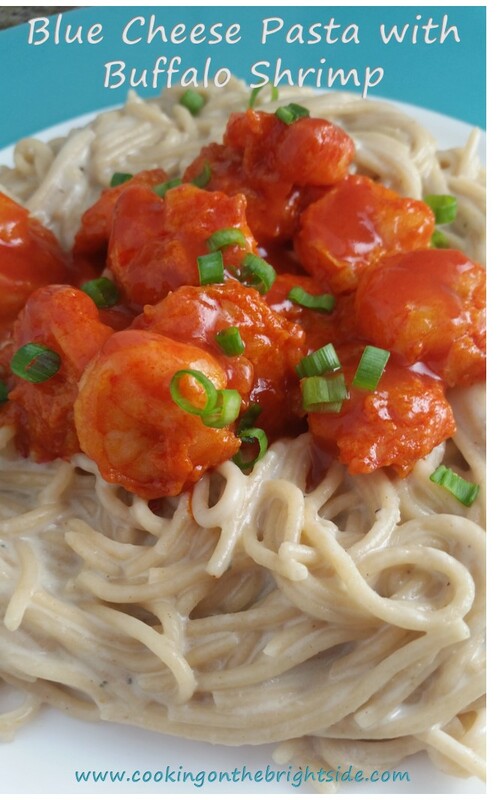 Add the pasta to your plate, top with the shrimp, making sure to drizzle with any excess sauce, and sprinkle with green onions. Serve with a slice of crusty bread for any sopping up – trust me, you won’t want any of this deliciousness to go to waste.